In the long run, it was not my eagerness, but my children, that gave me an opportunity to speak. Marilyn was so faithful in training her children. She had those little guys memorizing Scripture and character qualities and learning responsibility of the family. We dreamed of the day they would take their places in the adult world and we could enjoy the fruits of our labors in their success. It seemed a long time that they were just little children whom people thought very bright, but who were too young to really accomplish anything. Then one day, we woke up and our little boys were doing adult things. We had sons ushering in church, playing the piano, singing in the choir, remodeling the nursery. They were going to political conventions and working the polls. They were helping me make a living for their siblings and building a reputation in the community for responsibility and diligence. Gone was our secluded life at Concord which could have been even more happy and peaceful if only I had known how to wait on God and savor the season. It was no coincidence that as my children grew, so did our outreach. The larger our family became and the more our children began to do, the more people were interested in what Marilyn and I were learning. I had thought as a young man that I had so much to say and that the world was suffering because there was no platform from which I could say it. Frankly, that embarrasses me now because I’m finding that there is more I don’t know with every year that passes. And as I grow dumber, my children advance in their roles in the world outside the walls of our home and we, their parents, get more and more respect. It’s a mistake to try to make our children grow up too fast. I always looked forward to the days when our children would be teenagers, and now I wonder how I could have forgotten so quickly what it was like to be a teenager. I should have spent those early seasons enjoying my children as little ones and making the most of each day with them. Some people fear making their children too dependent on Mommy and Daddy. That’s like being afraid of gravity. Gravity has some disadvantages, but nothing to compare to being flung into outer space if gravity suddenly ceased to exist. I hope my children always feel the tug of home. I see the results of the opposite condition all through our society and wonder if all those working mothers and career-oriented, status-conscious dads really think it’s worth it to miss out on the springtime of their children’s lives. If Marilyn and I could offer suggestions to younger parents, we’d tell them to look at the bright side of each season of life rather than longing for a season that is not yet due, or is gone and can’t return. We lived through a time when we had no older children to babysit while we went out together and that seemed a disadvantage. Now we know that it was much easier having a quiet household then, than it is now. We could get everybody in bed at the same time at night and Marilyn could even get some quiet time during afternoon naps. We have our babysitters now and brother, do we need them! Gone are the long, quiet evenings at home with lots of time to talk. Now we have to go out to dinner to discuss anything at length. It’s not that our children are terribly unruly, but fourteen people in the same house can be a distraction. It may be that our twilight years will be our best. Then we’ll have our children raised and the financial burden eased so that we can rest and play more. I never want to retire, but I’d like to have more choice in how I spend my time. I want to bask in the glow of sons and daughters who are honoring God and enjoy getting acquainted with my new children by marriage. I want to see the family network expand and influence the world around us for the Lord. I’d like to write a book now and then, and occasionally have opportunity to speak to parent groups, encouraging them to make the most of the seasons of their children’s lives. One thing I don’t want in my later years is to regret my earlier life. I don’t want to look back on the times when there were little ones constantly wanting to be read to or played with in the sandbox and think that I never quite had enough time for those things. By then, I’ll know so very well that children don’t continue to want those things forever. I hope I’ll look back and remember thankfully that I subordinated my own interests and made the effort to invest in theirs. Today, life is demanding. We have infants to care for at the same time we have young men needing our help in making the transition into the adult world. We face constantly changing needs, clothing is continually being outgrown and it seems there is no end to the errands needing to be run. But it wasn’t always this way and it won’t always be this way. When the next season comes, I hope I look back on this one and recall that I wrung the good out of every day and took the lumps with some degree of patience. I hope that my children will remember happily how I dealt with them and want to deal with their children the same way. Lord, teach us to number our days that we may apply our hearts unto wisdom. 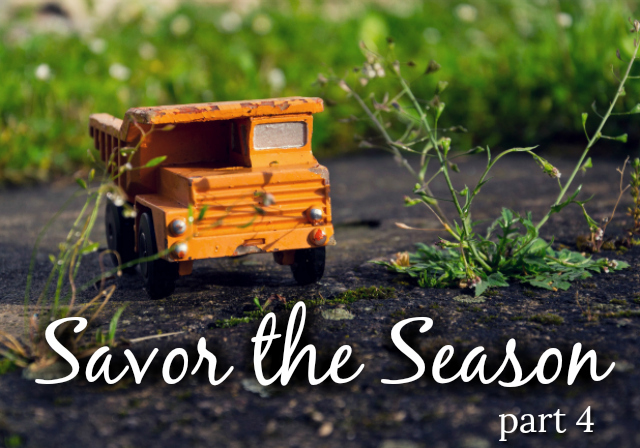 This entry was posted in Encouragement and Wisdom FOR Parents, Parenting, Parenting Series, Parenting Topics, Savor the Season and tagged boyers, children, large families, marilyn boyer, memories, Parenting, rick boyer, savor the season by Rick. Bookmark the permalink.